Procurement is changing. While traditional procurement functions have focused on purchasing, best-in-class companies are leveraging procurement departments as trusted advisors, aligning key functional groups with the company’s overarching strategic goals. How? 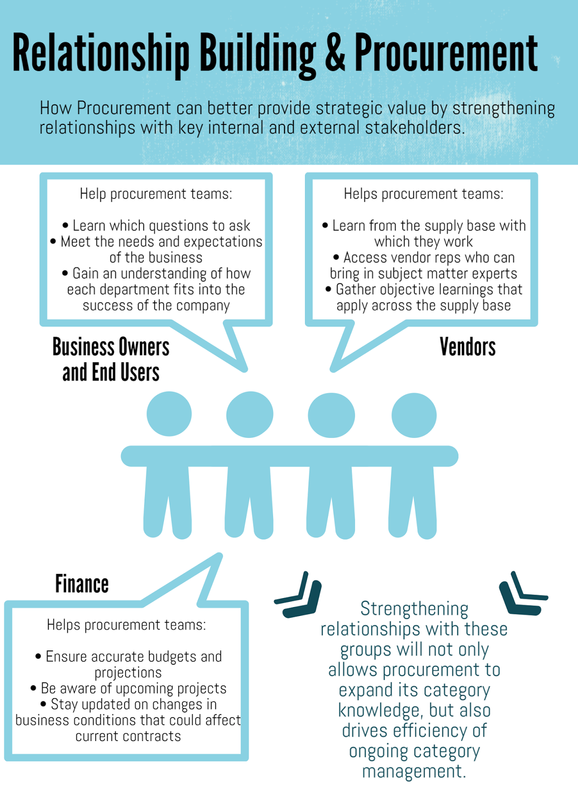 Procurement departments are constantly engaging a variety of stakeholders, both internal and external. By strengthening these relationships, procurement organization can gain insight into not only market conditions for various commodities, but also the ways in which internal groups can benefit from these trends such as lower pricing and new technological advances. There are a number of groups that stand to provide procurement with greater strategic value and vice versa including, Business Owners & End Users, Finance, and Vendors. Forming strong relationships between procurement and key groups both inside and outside the organization can not only help shorten any learning curve the procurement may have, but also provide the direction the department may need and allow procurement to serve as a strategic resource. Is your procurement department strategically serving your organization? Learn more about how you can evaluate your supply management organization through Source One’s Procurement Transformation Advisory.